With an objective to spread the traditional use and application of bamboo, Manipur is all set to organize the third edition of the World Bamboo Workshop (WBW) in Imphal from February 4 to 8 next. WBW is an annual event organized by World Bamboo Organization (WBO), USA, every year with an objective to bring all the scientific, technical and traditional knowledge available around the world in bamboo at that particular place. This is the third workshop in the series after the first held at Mexico in 2017, second in Peru in 2018, principal secretary P Vaiphei of Textiles, Commerce & Industries, government of Manipur told reporters in Imphal on Tuesday. The principal secretary Vaiphei said a total of 25 stalls will be opened at the city convention centre, the main venue of the workshop while another 50 more stalls will be opened at the Hafta Kangjeibing at palace compound in Imphal during the five days event to showcase bamboo related items and handicrafts etc. Besides a food stall will also introduced during the workshop for three days to conduct bamboo food cooking competition among 20 intending competitors as the state of Manipur which is known for its bamboo diversity, he added. Vaiphei also informed that the authority in the state of Manipur has framed a bamboo policy to promote bamboo in the region even though it was in a final stage. The five days event at Imphal will have lectures, hands-on training, exhibitions, cultural shows, and more on bamboo. 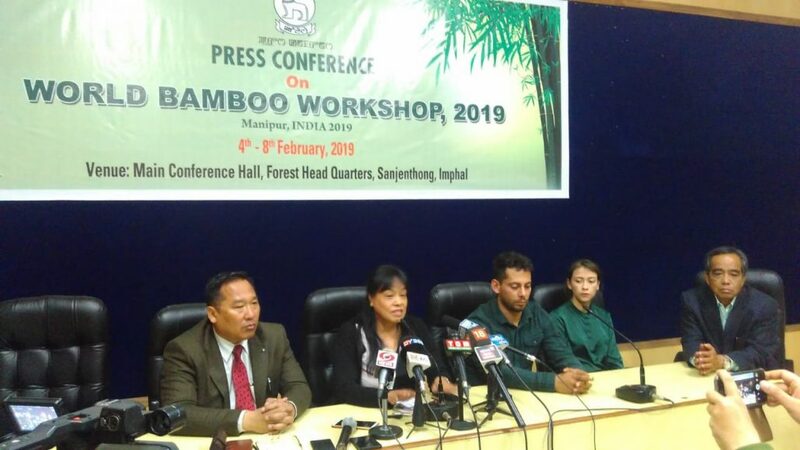 Around 100 participants from 34 countries are expected to join the workshop, World Bamboo Ambassador Dr Nirmala Chongtham, Professor in Department of Botany, Panjab University,Chandigarh said while participating in the interaction with reporters at Forest department office in Imphal. Dr Nirmala, a resident of Manipur and member of the WBO admitted that the workshop will also have plenary session wherein the experts from various parts of the world will give lecture and share bamboo technologies. Two Memorandum of Understandings will also signed with the state government and two different international level companies, she said adding that the two companies are DicMatrale Mexico (on construction sector) and Grow More Biotech,Bangalore (on tissue culture of bamboo). According to Prof Ch Priyoranjan who attended the gathering, the upcoming bamboo workshop could be a game changer for people living in rural Manipur as Manipur and North east alone contributes 68 percent of India’s total bamboo production even though the region occupies just 28 percent of India’s geographical area. Senior forest officers,officials from the transport department and university professor etc also attended the day’s interaction.